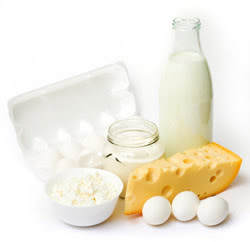 Dieters should eat foods rich in protein, mostly from dairy, to protect bones during weight loss ~ Health Matters Today! New research suggests that a calorie-restricted diet higher in protein—mostly from dairy foods—and lower in carbohydrates coupled with daily exercise has a major positive impact on bone health in overweight and obese young women. The study, published online in the Journal of Clinical Endocrinology and Metabolism, found bone health improvements were particularly evident due to the high density of bone-supporting nutrients such as calcium, vitamin D and dairy-based protein. For 16 weeks, three groups of overweight and obese, but otherwise healthy, premenopausal women each consumed either low, medium or high amounts of dairy foods coupled with higher or lower amounts of protein and carbohydrates. Calcium and vitamin D levels were also graded from low to high across the groups in conjunction with the dairy foods they consumed. The women exercised seven days per week, a routine that included aerobic exercise every day and two additional workouts of circuit weightlifting per week. "Our findings demonstrate the importance of diet composition to the maintenance of bone health status during weight loss," said Andrea Josse, of the Department of Kinesiology at McMaster and lead author of the study. "Our data clearly show dairy-source protein is important when aiming to avoid harmful consequences such as accelerated bone loss during weight loss. In our view, young women attempting to lose weight should consume a diet higher in dairy-source protein." A previous study from the same team in the same subjects showed that there were identical total weight losses across the groups, but very different results for body composition change with the higher-protein, high-dairy group experiencing greater whole-body fat and abdomen fat losses and greater lean mass gains. The same subjects consuming higher-protein and high-dairy diets for this study also showed the greatest improvements in markers of bone formation, no change in bone loss, an increase in circulating vitamin D levels, and a decrease in levels of parathyroid hormone, which when elevated is typically associated with bone loss. Maintaining or even improving bone health in young women, particularly in those trying to lose weight, is important for overall health, and may have great implications for decreasing the risk of diseases like osteoporosis later in life, say the researchers. "Our data provide further rationale to recommend consumption of dairy foods to aid in 'high quality' weight loss, which we defined as loss of fat and sparing of muscle, and the promotion of bone health in young women," says Stuart Phillips, senior author and a professor in the Department of Kinesiology. "These women are not only at the age when achieving and maintaining peak bone mass is of great importance, but in whom adequate dairy consumption would offset sub-optimal intakes of calcium and vitamin D."
Subjects undergoing weight loss while consuming marginally adequate protein without dairy foods showed markedly elevated levels of markers of bone loss indicating that following such a diet in the long-run would weaken bones.